Is it doggy day already? Things are getting exciting over at Dogs on Thursday. We are approaching the 100th post and having a contest, so be sure to hop wag on over and check it out! If you only stop in here on Thursdays, be sure to scroll back to Tuesday's post for a review of NuHemp dog treats & products! Teutul zipping like a maniac... before heading inside to cuddle up in his blankies. Lola, queen of the snow! I have loads of blogging catch up to do ... some FO's and adorable Emma pictures, but I'll leave that for tomorrow and leave the spotlight on the furbabies today. Well... on second thought, they will share just a little today, but its okay... they don't mind sharing with one particular munchkin. Besides, they are convinced she's saying "oooohh... doggy!!! cute doggy!!!" in the first pic... and I can't resist not sharing the second one. Emma got her little feeding tube removed yesterday... and could be coming home as soon as Saturday! I know you must be sick of the snow you have had this year. Funny how the dogs never seem to mind and acutally love it. Your niece is growing quickly! 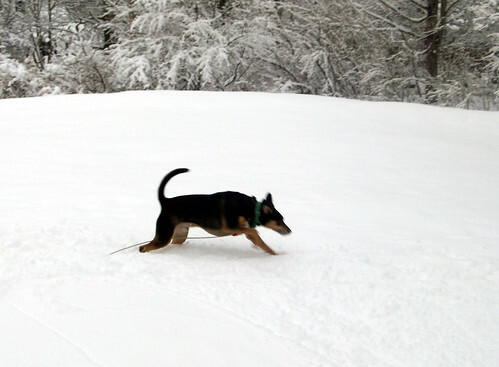 We snow zooming! What fun. Little Emma is so precious too. Glad the feeding tube is gone. Your Zeus reminds me so much of my first dog, Taffy; she was my best bud growing up, and was extremely smart! He looks alot like her - bet he's smart, too! Happy DoT, and have a howlin' good weekend ahead! I'm sure the furry kids are awaiting spring as much as you are. And Emma is a really adorable baby. With the feeding tube out, she should be able to go home soon, then your nephew will learn what parenthood is really like - delightful exhaustion! I'm with Chan...hello pollen. Ack. I haven't stopped sneezing for a week now. Love the last pic of Baby Emma. When does she get to go home? Oh boy, now you get to look forward to mud. Emma has grown so much and I love the peach fuzz hair. Your puppies are so much fun!! How do you keep up with all of them? What a darling baby! I am so glad she is progressing and will be home soon. Your dogs are adorable. They don't seem to mind the snow at all. what precious photos of the pooches and of emma too. she looks so sweet now. so happy for you all. I love seeing black dogs in the snow. So happy to hear she will be coming home soon. That baby is just too cute!! Too bad we missed snow this year. Maybe next year! good luck on spring! mom said rain is due in soon so as long as it stays warm that will help melt it! Of course here today is a gorgeous day and 53 out. But two days this coming week they are focasting us to get snow and our passes got 2 feet yesterday! lol, my neighbor wants to mow and edge our lawn tuesday, it is long in spots. Will spring ever truly come?? Yeah to emma! Glad Emma is doing so well. Love the photos! 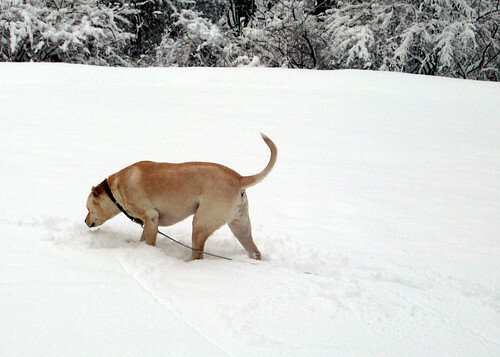 Zeus looks like he's having a blast in the snow. Wish Ginger could join him.